Who is supplying Congress’ talking points? The world will reconvene a UN conference on an Arms Trade Treaty (ATT) from March 18 to 28, 2013. While nations, including US finalize the treaty language negotiated last summer, the National Rifle Association (NRA) and its allies have mounted a campaign of lies and deliberate distortions aimed at building opposition to the treaty. As part of our efforts to highlight the truth, Oxfam has placed ads in Roll Call this week to encourage Members of Congress to acknowledge the fact that the ATT will not impact the Second Amendment rights of their constituents. If these two Supreme Court decisions aren’t clear enough to convince the NRA and its Congressional allies that the President cannot “end-run” the constitution through a treaty, the draft ATT text should be enough. The draft ATT states that it is the “sovereign right and responsibility of any State to regulate and control transfers of conventional arms that take place exclusively within its territory, pursuant to its own legal or constitutional systems.” In short, the Arms Trade Treaty excludes issues related to the second amendment from its scope. And even if it didn’t exclude these issues, the Constitution would not permit a treaty to override the bill of rights. Mr. Keene’s recent statement is only one of the many lies and distortions being repeated by the NRA and Members of Congress. 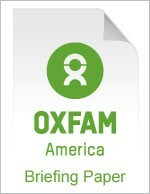 Oxfam has published a briefing paper on our website to help Members of Congress and the public separate the truth from the fiction. The global arms trade is out of control and a treaty is desperately needed. An effective ATT would be based on a simple principle: no transfers of weapons when there is a substantial risk that the weapons will be used for serious violations of international human rights or humanitarian law or will impair poverty reduction. To achieve this end, the treaty will do two basic things: first, the treaty will provide clear standards by which all States judge the appropriateness of a particular arms transfer. Second, the treaty will require all States to adopt a comprehensive import and export control regime to ensure weapons entering and leaving their country are under the control of competent authorities. No treaty will solve all the world’s problems, but the ATT will be a critical tool that for the first time will require all countries to take responsibility for their arms trade decisions. It is time for members of Congress to stop playing the NRA’s games and enter a real dialogue. Liars. Everyone of you. This is a global plot to disarm ALL citizens of the world and bring them under one world government. Thank you Oxfam, for picking up the beacon and shining a light on injustice. Those who want to change the world for good will always encounter the gullible, the angry, the stupid and the greedy who want the evil to continue for their own selfish reasons. It is never an easy path to make worthwhile changes that benefit many, but if there is no struggle, there is no progress. You are delusional if you truly believe the violence will stop if this treaty is implemented. The safest places in the world are not where guns are prohibited, quite the contrary. This treaty is a power grab, nothing more. How well has this idea worked in the financial world? The euro is a prime example, as well as what is happening with the Federal Reserve. The interests of the people are not going to be helped, or considered by those who seek control. I can only hope there are enough people not blinded by this propaganda to stop it.